We have been rightly horrified at the destruction wrought in Palmyra by ISIL, and at the looting and damage to the many cultural treasures in Afghanistan and Iraq. I’m just not so convinced that our own house is in order. Whenever I visit a site of great cultural importance, such as Cairo with its pyramids and sphinxes, Rome with its extensive remains of the Roman Empire, or even the more mundane Paris and London, I am saddened at how our modern cities have overwhelmed the riches of their past. It is exciting to bump into famous fountains and monuments just around the corner from the local McDonald’s, but we have never had any qualms about moving or demolishing them when we think we have something better with which to replace them. Often our wilful damage puts irreplaceable works of art at risk. When researching my recent articles about Masaccio and his frescoes in Florence, which were key to the development of Renaissance painting and much of subsequent European art, I was amazed to discover how lucky we are that they were not destroyed centuries ago. Masaccio’s most important frescoes are in the Brancacci Chapel in the church of Santa Maria del Carmine, which was very badly damaged by fire in 1771, and above all his Holy Trinity in the church of Santa Maria Novella, both in Florence. 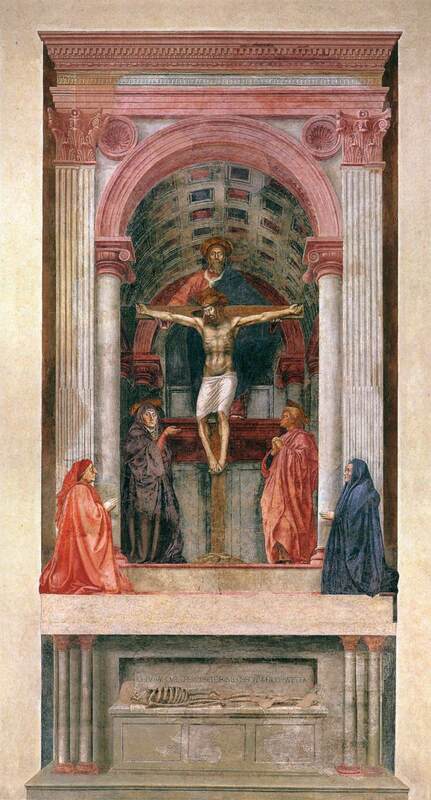 Masaccio (1401–1428), The Holy Trinity (1426-8), fresco, 640 x 317 cm, Basilica of Santa Maria Novella, Florence. Wikimedia Commons. Yet a few years later, in 1565, that same Vasari (whose praise of the Holy Trinity in the second edition of his book in 1568 was even greater) painted over parts of Masaccio’s fresco, and in 1570 Vasari’s altarpiece was installed in front of what remained of Masaccio’s work, obscuring it from view until 1861. As if that were not enough, in the late 1850s it was decided to remodel the interior of Santa Maria Novella according to prevailing taste. Before Masaccio’s masterpiece, the foundation of all subsequent realist painting, could be seen again, it had to be moved as it ‘interrupted the rhythm of the nave wall’. In 1858, most of the fresco was detached from the church wall and moved to the entrance wall. Not all of it, though: the skeleton and tomb below were left in place, presumably because they had been forgotten. Then in 1950, the remains of the main part of Masaccio’s fresco were restored, the bottom fragment rediscovered, and the two parts were finally reunited when the top section was moved back to its original location. It has remained there since 1954. Ornella Casazza’s account of the abuse which this painting has suffered almost defies belief. Schemes such as the UNESCO World Heritage Sites have brought more general recognition to the priceless treasures of the many cultures around the world. But, as with the Bamiyan Buddas, dynamited by the Taliban in 2001, damage to the city of Timbuktu by Islamists in 2012, and the destruction of Palmyra by ISIL in 2015, our vandalism continues unabated. As a species, the one thing that we do well is destruction. Casazza O (1998) Masaccio’s Fresco Technique and Problems of Conservation, pp 65-89 in Goffen R (ed) Masaccio’s Trinity, Cambridge UP. ISBN 978 0 5214 6709 4. Posted in General, Life, Painting, Technology and tagged art, Bamiyan, Florence, Masaccio, painting, Palmyra, Timbuktu, vandal, Vasari. Bookmark the permalink.